As much as my mother may advocate and believe it, I am very far from perfect. In fact, as is the case with everyone on this planet, I should be described as remarkably imperfect. Sometimes I forget to keep promises. Sometimes I unintentionally keep secrets from people. Sometimes I write things on my blog that I expect no one but my family members to read. However, just because we’re blunder-prone creatures, it doesn’t mean that such character flaws are actually detrimental. That is, there is a bit of research showing that having these blemishes can actually make us more attractive to others. 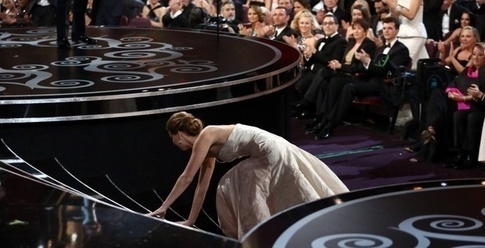 When celebrities like Jennifer Lawrence make a blunder (like tripping above) we tend to like them more. But why would this be? Wait, what? How could an imperfection lead to someone liking us more? Originally documented in 1966, researchers brought participants into the lab and played a tape for them in which a researcher interviewed one of four, ostensibly real people. In one condition, students learned about an impressive peer: he was very smart, active in the community, and a skilled athlete. For the less impressive peer, he was described with average intelligence and moderate involvement in other activities. Now, at the end of tape-recorded interview, for two of the conditions, participants hear the impressive (or less impressive peer—depending on the condition) clumsily spill coffee on himself. For the other two versions of the impressive and less impressive students, they conclude their interview without this blunder. Subsequently, the participants were asked to rate the attractiveness of the student they had learned about. For the less impressive peer, the blunder at the end of the interview reduced their attractiveness. However, for the impressive peer, spilling coffee on himself actually made him more attractive (see the table on the right). That is, when we believe someone is amazing, they almost seem “too good to be true.” Their blunder (or pratfall), however, makes them more relatable and therefore more approachable and likeable. Throughout our days, we constantly compare ourselves to others, but comparing ourselves to someone we believe is better than us, often lowers our self-esteem or incites envy. However, when this “superior” individual makes a blunder, it helps to lower our evaluation of them and make them seem more similar to us. Interestingly, for those very high in self-esteem, seeing a pratfall in someone else doesn’t have the same effect. That is, the high self-esteem observer already believes him or herself to be “perfect” in a sense, so seeing this other impressive individual make a blunder actually reduces their perceived attractiveness (because now this person is less similar to the “perfect” observer). However, narcissists like that are a whole other topic for a discussion another day. For now, just let it be known that I have plenty of pratfalls in case you thought otherwise. But heck, if you’ve read even a single one of my blogs, you would be well aware of my penchant for stupidity. Aronson, E., Willerman, B., & Floyd, J. (1966). The effect of a pratfall on increasing interpersonal attractiveness. Psychonomic Science, 4(6), 227-228. Helmreich, R., Aronson, E., & LeFan, J. (1970). To err is humanizing sometimes: Effects of self-esteem, competence, and a pratfall on interpersonal attraction. Journal of personality and social psychology, 16(2), 259.